"A private equity firm like Bain typically seeks out floundering businesses with good cash flows. It then puts down a relatively small amount of its own money and runs to a big bank like Goldman Sachs or Citigroup for the rest of the financing. (Most leveraged buyouts are financed with 60 to 90 percent borrowed cash.) The takeover firm then uses that borrowed money to buy a controlling stake in the target company, either with or without its consent. When Bain borrows all of that money from the bank, it's the target company that ends up on the hook for all of the debt. A win-win as they say, unless you actually work in a company acquired by an equity firm. Here is an example of an actual company. "Take a typical Bain transaction involving an Indiana-based company called American Pad and Paper. Bain bought Ampad in 1992 for just $5 million, financing the rest of the deal with borrowed cash. Within three years, Ampad was paying $60 million in annual debt payments, plus an additional $7 million in management fees. A year later, Bain led Ampad to go public, cashed out about $50 million in stock for itself and its investors, charged the firm $2 million for arranging the IPO and pocketed another $5 million in "management" fees. Ampad wound up going bankrupt, and hundreds of workers lost their jobs, but Bain and Romney weren't crying: They'd made more than $100 million on a $5 million investment." "The entire business of leveraged buyouts wouldn't be possible without a provision in the federal code that allows companies like Bain to deduct the interest on the debt they use to acquire and loot their targets." So Taibbi is right when he says that Romney complaining about excessive debt is ironic, to say the least. "economics based on maximization-with-equilibrium. We imagine an economy consisting of rational, self-interested players, and suppose that economic outcomes reflect a situation in which each player is doing the best he, she, or it can given the actions of all the other players. If nobody has market power, this comes down to the textbook picture of perfectly competitive markets with all the marginal whatevers equal." This is clearly incorrect. First, classical authors, meaning those that followed the surplus approach (from Petty to Marx, including Quesnay, Smith and Ricardo) did assume that economic agents were rational and self-interested and they also believed that the economy could be represented by equilibrium outcomes. And they clearly were not neoclassical, meaning they did not believe that supply and demand determined long term prices (natural prices as Smith and Ricardo referred to them, or prices of production in Marx's terminology). If profits were higher in a particular sector, capitalists would try to gain from those opportunities entering the industry, and in the process would lead to a uniform rate of profit. Market prices, determined by supply and demand, would gravitate around the long term equilibrium prices that were determined by the technical conditions of production, and the previously given real wage (by conflict), in modern parlance (on the issues raised by the Labor Theory of Value, and Sraffa’s solution just check other posts in this blog). More importantly, there was no mechanism (even in the case of those classical authors, like Ricardo, that accepted Say’s Law) that implied full utilization of labor, capital or any particular means of production. Wage flexibility did not lead to full employment. The hallmark of marginalism is the notion that supply and demand determines simultaneously the equilibrium long term prices, and that price flexibility leads to full utilization of resources, something that the capital debates have demonstrated long ago it cannot be done. In this regard, Krugman decides (because it must be advantageous) to follow those that he criticizes, and remains oblivious to both logic and empirical evidence. If he wants to be coherent with his Keynesian ideas, he should get rid of the notion of a natural rate of unemployment (or and of interest). There are two aspects of the discussion that has taken place in the last weeks (here, here, here, here). The first mainly concerns my first post and regards whether monetary sovereignty is a condition both necessary and sufficient for any country to pursue development and full employment policies; the second concerns the Eurozone (EZ) crisis and was the subject of my second post. Wray mainly focuses on the second issue, and I will do the same. In part 1 of my reply I will, however, briefly dwell on the first aspect that is anyway preliminary and which will lead us to touch upon the EZ troubles anyway. The two questions we deal with in part 1 will, respectively, be: are balance of payments (BoP) preoccupations irrelevant for countries endowed with full monetary sovereignty? Can a currency union suffer of internal BoP troubles? Part 2 (will be posted later) will then be devoted to Wray’s explanation(s) of the EZ crisis. The main argument of my first post was that monetary sovereignty, although a necessary condition for development and full employment policies, is not the magic wand to solve the foreign constraint to those policies. This constraint can be summarised as the necessity for peripheral countries – a set that include from developing countries to highly developed countries like France or Italy – to acquire enough international liquidity to finance the amount of imports generated by a satisfactory level of growth [a useful critical discussion of the theory of the balance-of-payments-constrained growth as presented by Thirlwall - and inspired by Kaldor - is in Palumbo (2012)]. Unless a country issues an internationally accepted currency, no monetary sovereignty would automatically allow fiscal policy to sustain domestic demand in peripheral countries without risking the vicious circle of a falling foreign exchange rate and high inflation. When Mitterand took power in 1981 with strong Keynesian ideas, few month were enough to change his mind – that is to realise that without the German cooperation, that was not there, no expansion in a single country was possible (unless you are ready to adopt more radical measures like import restrictions that, indeed, were in those years proposed by Godley). And that was France! This is not to say that full monetary sovereignty is not relevant, quite the opposite, in the first place in order to pursue a competitive exchange rate and in order to release more space to policies in support of domestic demand consistently with current account (CA) equilibrium. Unfortunately, at least until the late 1990s, peripheral countries have traditionally tried the shortcut of stabilising the nominal exchange rate and financial liberalisations in order to attract foreign capital inflows. In a meaningful sense the poor experience of a number of peripheral countries in the European Monetary Union (EMU) – including Spain, Ireland and Portugal - has been similar and is described on similar lines by Roberto Frenkel (2012), Cesaratto (2012a), Bibow (2012) and many others. We shall come back on this. From the ensuing debate on blogs, FB etc, it seems that my position has convinced a number of people, likely opening the eyes to some. This was very important for my country in which is very dangerous that too simple formulas enter into the political debate, already suffering of the mainstream vulgarities also influential on the left (see Cesaratto and Pivetti), and of “Berlusconism”. Of course, “Modern Monetary Theory” (MMT) as such has nothing to do with this. I have also been careful to isolate the important messages that come from it, e.g. that a country with full monetary sovereignty cannot default on its sovereign debt if denominated in its own currency. This is important and refreshing, but we cannot stop there. “So, yes, the US (and other developed nations to varying degrees) is special, but all is not hopeless for the nations that are “less special”. To the extent that the domestic population must pay taxes in the government’s currency, the government will be able to spend its own currency into circulation. And where the foreign demand for domestic currency assets is limited, there still is the possibility of nongovernment borrowing in foreign currency to promote economic development that will increase the ability to export. So Wray recognise the particularity of the U.S. and of some other developed countries that, as Australia, have enormous endowments of natural resources and stable institutions. What the normal countries might do is then to appeal to official aid, to rely on remittances or on FDI, or finally … to liberalise finance and commit to a stable nominal exchange rate in the attempt to attract foreign capital (what is implied by Wray’s suggestion of “nongovernment borrowing in foreign currency”). A similar position expressed by Bill Mitchell is quoted by blogger “Lord Keynes” (who has words of appreciation for my posts, thanks!) as a possible MMT reply to my view. What Mitchell says is that we should have a new and progressive IMF that alleviates the foreign constraint. But we have not it and we shall not have it, even admitting that it would be sufficiently powerful to solve the problems of big countries. Well, anybody can judge the frailty of these replies. So we remain with a single result: a sovereign central bank is a necessary, essential step, but is not the solution to any problem in all countries. Of course, the renunciation to full monetary sovereignty is at the bottom of the EZ crisis, but as I argued in my posts, in the first place from the “external” point of view of the ensuing loss of competitiveness for peripheral countries and not-so-peripheral countries like Italy (we shall see in the second part, posted later, that Wray is close to recognise this in his reference to Kregel; monetary unification and financial liberalisation created further troubles on which we shall return in the second part). Wray tends, however, to deny that the origin of the EZ crisis is mainly in the foreign imbalances. His main argument is that had the EZ been a currency area like the US, it could not have balance of payment crisis. This is so because in the US “we use fiscal policy [that is fiscal transfers] to try to overcome the negative effects on standards of living across states due to different multipliers and other factors related to these current account flows.” (Wray here). So the conclusion is that the EZ crisis “it is not a simple current account story. It is an MMT story about the constraints imposed due to the setup of the EMU, which separated fiscal policy from the currency.” Consider also (Wray here): “We went on to examine the claim that the Euro crisis is a simple BoP problem. That, too, is fallacious. If the EMU had been designed properly, it would not matter whether some member nations ran current account deficits—much as many US states run current account deficits.” So the problem is that the EZ is not the US, since if it were, no BoP crisis would have occurred! It is as one warns not to drive a car with three wheels and somebody else replies: don’t worry, just assume you have four. Warren Mosler’s (implicit) reply to my posts admits it: the CA imbalances are a problem that a sovereign central bank cannot solve and one solution is for the EU to have fiscal transfers of the size of the US and nobody would talk anymore of the EU imbalances. Well, but we have not this Europe and we shall never have it (I clearly myself wrote, as “Lord Keynes” correctly recalls, that the EZ could be a perfect MMT country). To sum up, Wray’s reasoning is the following: the monetary unification might well have created CA problems (see in Part 2, to follow tomorrow, of this post his reference to Kregel). Transfers from a substantial federal European budget backed by a genuine European central bank (CB) could compensate those imbalances without much pain for the richest local states but as a component of full employment policies. We may then deduct from this that since Europe has not this framework, then it suffers of a CA crisis (although a specific one, as Frenkel or myself have pointed out, we shall return on this). Wray, however, infers that since the EZ could have avoided the crisis, had it the right framework, then it is wrong to talk of a CA crisis. This sounds rather illogical, isn’t? However, once the argument is presented in an ordered way – a wrong institutional design of a non-OCA precisely produces a (specific) BoP crisis – the distance be Wray and me may disappear (see Godley 1991 and Kregel). Notably, the origins of this “wrong institutional design” are not in the ignorance of the political designers. The same inventor of the OCA, the conservative economists Robert Mundell, has recently pointed out that the Euro has not been a failure as long as the ensuing disasters are leading to the destruction of trade unions and the social state, but I suppose this is also an area of broad agreement. A commentator wrote: “The balance of payments position is MMT’s Achilles hell and more and more people are starting to realise it”. I do not think this implies that MMT has not very interesting things to say once it becomes less self-referred. Things have changed in the meanwhile. Stephanie Kelton has showed great understanding for us, and I believe that her feeling is shared also by other MMTs. We are thinking about having an event together in Rome during her visit to Italy (with Auerbach and Mosler). Even if we shall not be able to organize it, the very fact that we tried is very encouraging." In an old paper, that I quote in Cesaratto (2012), Kregel warns that FDI is a dangerous form of foreign debt. I wish to be conciliatory and avoid sarcasms in this note, but these replies remind me the sentence that Rousseau attributed to Marie Antoinette: « Enfin je me rappelai le pis-aller d’une grande princesse à qui l’on disait que les paysans n’avaient pas de pain, et qui répondit : Qu’ils mangent de la brioch » . Unfortunately, like Marie Antoniette’s brioches, neither conspicuous official aid, nor a progressive IMF, nor democratic FDI that distribute or reinvest profits in the host country, nor successful currency board are there to help. The non generality of the MMT’s view has been acknowledged by “Lord Keynes”: “MMT would work very well for (1) the US, (2) those nations with strong trade surpluses (say, Germany and Japan), (3) those nations that seem to run near perpetual current account deficits but attract a lot of foreign capital (say, Australia), and (4) even the Eurozone, if it were suitably reformed with a union-wide fiscal policy, would be able to achieve full employment via MMT-style policies. In short, for most of the Western world: it certainly makes sense, and can be regarded as just a more radical form of full employment Keynesian economics. That is why Post Keynesians, by and large, are reasonably receptive to it. To this Ramanan replied that "for most Western nations" is inexact: “Most Western includes Spain as well which obviously has a constraint. You guys will always make overkills to prove a wrong point.” Interestingly Dan Kervick added: “On neo-chartalist principles, the scope of a county's ability to generate demand for its currency would be determined by the scope of its power to tax. If the Duchy of Grand Fenwick can successfully impose and collect a tax on its people payable in Fennies, then it can successfully create demand inside its country and among its own people for Fennies. That doesn't mean it can create demand for Fennies in Indonesia simply by imposing the tax on Grand Fenwickians”. And “Bruce said”: “MMT is not a magic pill that can convert a country that is deficient in vital scientific and business skills into a wealthy nation.” (I do not believe these people are Trolls, although I much preferred that everybody would use their proper name, particularly of academics, that are without problems of professional privacy). All quotations from here. The direct intervention of the ECB to sustain the public debts of uncompetitive peripheral EZ countries is a surrogate of fiscal transfers, as Wray alludes in a discussion with Ramanan (who, of course, fully agree): “’transfer’ is the wrong word. Uncle Sam issues the currency and does not have to reduce income in one state to increase it elsewhere. … If we had a fixed economic pie then in real terms we'd be transferring real stuff to the poor regions. But that ain't true, either, as outside WWII we've never operated continuously at anything approaching capacity”. In other words, it would be equivalent if, using the MMT’s wording, a federal Bruxelles “writes a cheque” (creating a deposit at the ECB) financing “fiscal transfers”, or if the ECB directly buys the deficit countries public debt (for a clarification of the MMT’s view see Lavoie). So the presentation of my thesis that Wray provided is rather unfair: “As discussed at GLF recently, Sergio Cessaratto [sic] (and others) think we got it wrong–our claim is ‘spurious’. MMT is not useful for helping to understand the crisis. It is not a sovereign currency crisis, it is a balance of payment crisis. They have not yet explained why South Dakota or Alabama or Mississippi is not suffering the fate of Greece.” Precisely because Greece is not South Dakota, that country is suffering that fate. The quote above is from Raúl Prebisch's classic paper "The Economic Development of Latin America and Its Principal Problems," the so-called Development Manifesto (available in Spanish here), published in Spanish and Portuguese in 1949, and the following year in English. 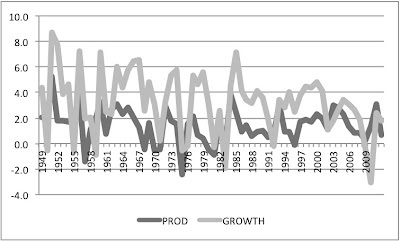 Note that his explanation for the tendency of terms of trade of commodities to fall over time (the so-called Prebisch-Singer hypothesis) was based on the fact that in the boom wages went up in the center, but not so much in the periphery, since industrial workers in the center were organized and could demand higher salaries, while that was not possible for the agricultural and mining workers in the periphery. So in the recession, while prices of commodities and wages fell in the periphery, they didn't in the center. Class conflict, and not just technological change, was at the heart of the asymmetries between the center and the periphery. Hence, industrialization in the periphery, and the re-organization of the labor force, would imply that more workers in the periphery would be able to keep part of the benefits of higher productivity. Industrialization would be good for the production of the commodity sector, since prices of commodities would go up, with higher wages in the periphery. Also, note that this explanation of terms of trade suggests that if wages in the periphery fall, then the prices of commodities fall too. And it is worth remembering that a depreciation of the currencies of peripheral countries implies lower wages. Well not really, but they do cite the Cartalist approach of Charles Goodhart and wonder about it and the meaning for US dollar hegemony. They contrast Cartalism (or Chartalism) with the marginalist approach of Menger, but do not cite Georg Knapp or Abba Lerner or Keynes (of the Treatise on Money) as precursors of Goodhart, or any MMT author for that matter, following the tradition that the acceptable critiques of the mainstream have to come from within. Interestingly the specific take of the piece, the relation of Cartalism and dollar hegemony, has been the theme of our posts (here, here and here), and at least one paper. What are these guys reading? PS: The classic book by Knapp on Chartalism is available here. 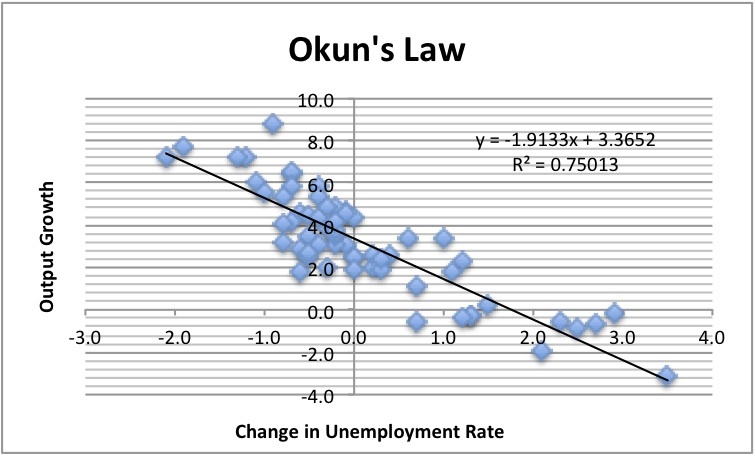 A comment on a previous post suggested that Okun's Law is not valid anymore. Not the first time this claim is made, by the way (see also previous discussion here). So let me be clear, there is as much reason to believe that Okun's Law is gone as you might have about the demise of the Law of Gravity. The graph below shows an admitedly very crude econometric rendition of the Law using annual data from 1948 to 2011 (data available here). It says that if you grow approximately 1,91%, then the unemployment rate falls 1%, which is close to the 2 to 1 ratio to be expected. Further, and more importantly, note that what Okun's Law says is that ﻿productivity is pro-cyclical. That is, unemployment changes less than output, so in a boom you hire less workers, since they are more productive and can increase output more than proportionally, while in the recession you fire less workers than you would need to produce given the fall in output, meaning that their productivity falls (usually explained as a result of the costs of training the labor force, so firms keep workers idle, because in a boom it would be worse if they had to retrain the labor force). 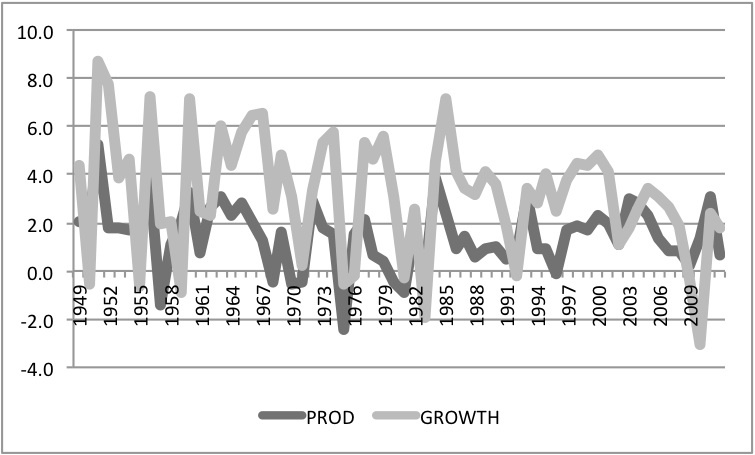 Graph below shows the evolution of output growth and productivity growth for the same period. Clearly labor productivity was and still is pro-cyclical. Sure enough in very short periods you might have that the relation between output an hiring changes, and it gives the impression that the Law is broken. Also, it might happen that the magnitude of the relation is variable, and you have less hiring with an increase in output (like in a jobless recovery, which would be the last three recoveries including the current). * But the Law still works, that is, more output does lead to more hiring of workers at a less than proportional rate, and labor productivity is pro-cyclical. 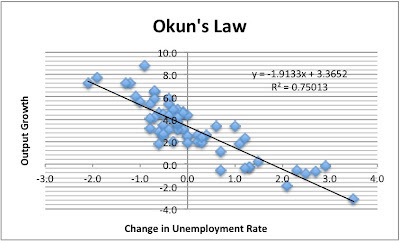 Note that, in part, the political reason for suggesting that Okun’s Law is broken is to argue that expansionary policies cannot solve the unemployment problem. That argument is bogus. So don’t worry, Okun is doing fine. Be happy! * I personally believe that the changes, and the so-called jobless recoveries, are not directly related to the Okun component of the relation between growth and productivity, but to the long run or trend component (the so-called Kaldor-Verdoorn's Law). I have written on the subject here (or here). Nick Rowe gives a shot to the capital debates, which is a nice development indeed. [Robert Vienneau has a lenghty reply here.] In spite of the importance of the topic, and the previous engaging of mainstream economists like Samuelson, Solow – to cite two prominent ones – the topic has all but vanished from modern mainstream economics, with a consequent loss of understanding. Let me clarify a few things before we get to Nick’s post. As I argued in a previous post, classical authors (e.g. Smith, Ricardo and Marx) understood that they needed to determine the rate of profit independently from relative prices to avoid circular reasoning. The Labor Theory of Value (LTV) provided a solution. Prices were determined by labor incorporated (or commanded for Smith) and profits, and the surplus, were determined on that basis [Sraffa’s solution to the problems with the LTV build on Ricardo’s use of a commodity, corn, to measure the profit rate as a ratio of two physical quantities]. However, most neoclassical/marginalist authors today are completely oblivious to the fact that their theory too must deal with the independent determination of the rate of profit and relative prices, and that this is problematic if you also accept the notion of a uniform rate of profit (a natural rate of interest). Also, and before I show why the problem is a general one, that any theory has to deal with it is essential to note that the rate of profit and the rate of interest must be in the proverbial long run (when everything is flexible and there is no ceteris paribus) in equilibrium. That is, either the rate of interest adjusts to the rate of profit (the position taken by Ricardo and Wicksell, which called the real variable the natural rate of interest), or vice versa (as Tooke and Sraffa believed; Marx and Keynes pose more problems to be clearly defined, but I would put them in this camp too). In the case of neoclassical economics, if you want to determine the natural rate of interest by the interaction of the discounted profitability of investment and the intertemporal savings (i.e. consumption) decisions of agents, you must be able to bring the gains to present value (as in the examples provided by Nick). That means that the discount rate (to bring the investment schedule to present value) must be known, while the rate of interest you want to determine requires knowing the value of investment (the demand for capital goods). Thus, we encounter the circularity of the determination of the natural rate of interest in the Loanable Funds Theory, noted by Joan Robinson long ago. Note also that the process implies that the rate of interest (which in equilibrium is equal to the rate of profit) is a variable that is determined by intertemporal decisions, which must equalize the rate of profit associated with the production of capital goods (i.e. produced means of production). What happens if, as Nick suggests, “There isn’t just one future period; there are many future periods.” Nothing much really happens, since for all those possible future periods, there must be a uniform rate of profit. For several different capital endowments, or several different sets of preferences (which seems to be what Nick has in mind), the interaction of investment and savings will solve for the rate of interest. But the inconsistency is still there. But really what Nick is suggesting is that one might have a multitude of interest rates (which he refers to as the term structure, but think more of a term structure of interest rates associated with different capital goods, rather than financial ones, even if you do have monetary rates too). In fact, that is exactly what the mainstream did, when they changed the notion of equilibrium, as noted by Garegnani in his 1976 paper. It was only then, after the capital debates, that the Arrow-Debreu (AD; not Anno Domini) intertemporal general equilibrium notion became dominant. In that case you must give up the notion of a uniform rate of profit. Note that you cannot have both (in his replies to my comments Nick seems to believe that you can have it both ways; scroll down for the various comments which are worth reading I might add). So let me clarify what I mean. Capital goods, the produced means of production, are an heterogeneous set of goods, but if one believes in competition (in the classical sense of free entry) then one must believe that a uniform rate of profit on the supply price of those goods will be established (not as a real world phenomena, but as a tendency; the long run is a theoretical construct). So what is established by free entry (and not arbitrage, which would be associated with the equalization of prices in an exchange economy) is a uniform rate of profit across sectors. So what does that mean about the term structure? First, the term structure of monetary rates (i.e. the Fed Funds versus the ten year Treasury bonds) depends on the actions of the central bank, among other things (and I’ll let that for another post; mind you as you see I tend to think the monetary rates rule the roost, as Tooke and Sraffa). Nick is talking about the real or natural rate, having for reasons associated with the demand (the preferences about consumption in the future) different levels. That is, there would be more than one natural rate, associated with different preferences regarding consumption [echoes of the Sraffa-Hayek debate about the existence of several own rates of interest perhaps]. Yet, the point still is whether you have competition (free entry) or not. So if more people, as in Nick’s example, want to consume more in 7 years, wouldn’t the supply of capital adjust, to provide more in that year allowing for the consumption binge, and reduce the gains associated with providing more goods in that period? After all there is no reason for profitable opportunities, unless there are imperfections (e.g. lack of capital mobility or lack of information, which does not seem to be what Nick is arguing, since he says that "everybody knows"), to be left unfulfilled. The intertemporal nature of the decisions, meaning the decisions are being made now with all the information available about the future, does not affect the equalization of the rate of profit (interest). So competition should also lead to a uniform rate of profit not across different periods of time, but now for different states of preferences and the capital endowments (and technology of course). Hence, the existence of a myriad of capital goods, or changing preferences (or technological change, which used to be the one that the capital debates concentrated more), do not per se justify abandoning the notion of a long term uniform rate of profit. That is what the AD model does. 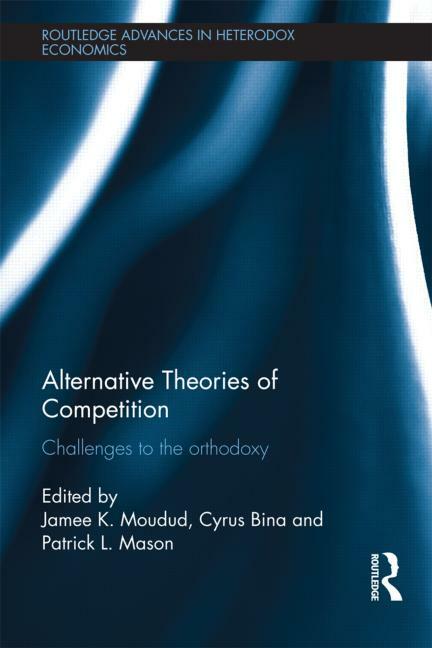 In the process it abandons the classical notion of competition (free entry) for one that has less meaning from the point of view of understanding capitalism (atomistic agents that are price takers; both links to the New Palgrave require subscription I'm afraid). Note that the centrality of the results of the capital debates is that one cannot say that changes in relative prices govern decisions about the allocation of resources in any clear way. Not only capital will not be used more intensively with lower rates of interest (even if lower rates of interest may stimulate other forms of demand, not capital, and eventually lead to more demand for means of production), but also lower real wages (the relative price of labor force) might not lead to higher employment. Think of the policy implications of this result for Europe now. But let me finish saying that beyond the differences we might have, real or of interpretation (and I think both things play a role), I think it is important to thank Nick for thinking about the relevance of these issues and taking them seriously, which can only lead to clarify differences and provide a better understanding, if not of the real world, about what economists think about the real world. And that is a step in the right direction. In my intermediate macroeconomic classes at the University of Utah I always start by asking students what do they think is a more socially relevant problem an increase in inflation of 1% or the same 1% rise in the unemployment rate. Although the answers vary somewhat according to the macroeconomic circumstances, it is almost always true that the vast majority of my students think that inflation is the real problem. When pressed on why do they think inflation is worse than unemployment they rarely suggest that inflation may hurt the poor more than the affluent, which would show a concern with income distribution, or seem to understand that moderate inflation might be good. Further, they have no idea that deflation is considerably worse than inflation, and that the reason for that is that deflation causes severe unemployment. The point is that they seem to think that unemployment does not hurt them more than inflation; after all they are getting a college education (which is not much of a guarantee these days, but I leave that issue for another post). I then tell a personal story about inflation and unemployment and why one should be concerned with unemployment. In the Fall of 1999, fresh out of graduate school, I was hired as the Assistant Director of a small think tank. As I learned afterwards, there were another 5 candidates for the position. The average unemployment rate in 1999, I might add, was approximately 4.2 (see here). As it turns out I had another interesting piece of information that one seldom has about a particular position, namely: the number of applicants for the same position the previous time it opened up in 1995. I always ask my students then, if you know that the rate of unemployment was around 5.6% (here again), that is, 1.4% higher than in 1999, how many people do they think applied for that same position back in 1995. They never get anything close to the 300 or so that vied for the job. In other words, in this particular case, a 1.4% higher unemployment rate implied an overwhelming difference in terms of competition. Of course one cannot, and should not generalize from one observation, but the anecdotal information fits the more substantive evidence for a tight labor market in the late 1990s, in which we actually saw increases in real wages for average workers in the Unites States. If for no other reason, students, and everybody else, should be concerned with unemployment, because 1% more in the rate can hurt considerably more than the equivalent change in prices [ and that is why Okun's Misery Index, which adds the unemployment and inflation rates makes little sense; it mixes apples and oranges]. But even further, it is important to remember that whereas inflation hits everybody more or less equivalently – even if people have different consumption baskets – unemployment is a divisive social problem, which makes some ‘losers’ and others ‘winners,’ causing deep divisions in society (e.g. immigrants rob our jobs). It is for that reason that full employment is the most important economic and social policy, the foundation on which to build the other policies. Work defines our lives, to a great extent, and gives dignity to people. And I do not mean just the poor. As I tell my students, I am a big believer in the ethics of hard work, and that is why I think rents and wealth should be heavily taxed, so that everybody needs to work to earn a living. 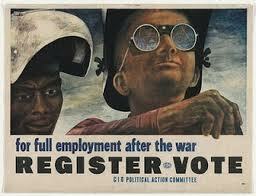 That is full employment for all! Sraffa and Marxism or the Labor Theory of Value, what is it good for? 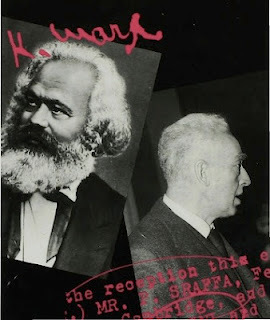 An old, but not completely closed, debate revolves around whether Sraffa was a Marxist or instead he should be seen as Ricardian, hence the term Neo-Ricardian used derisively by Bob Rowthorn (subscription required) and other Marxists authors (and also by Frank Hahn, again subscription required). From a personal point of view there is little doubt that Sraffa identified with Marxism, and close friends like Antonio Gramsci and Maurice Dobb would agree. But the important question is whether his contributions in Production of Commodities by Means of Commodities (PCMC) should be seen as a development or a criticism of Marx's theoretical tradition. For the most part the question revolves around the relation between Sraffa's prices and the labor theory of value. Several authors tend to believe that the latter theory is central for Marx's theory of exploitation. Recent interpretations such as the so-called New Interpretation (NI) and the Temporal Single System (TSS) would agree on that point. "Central to Marx's framework of analysis in Capital is the labour theory of value (LTV), which defines the value of a commodity as the ‘socially necessary’ labour time required by its production, that is, the labour time required by average available techniques of production for workers of average skill. The LTV is central to Marx's theory of exploitation, a term he uses to describe a situation in which one individual or group lives on the product of the labour of others." The question then is what was the role of the labor theory of value in Marx and the classical authors, i.e. for the surplus approach. The initial problem that Smith was trying to deal with the LTV was to determine the rate of profits independently of prices, since profits were considered essential for capital accumulation. Note that one needs the prices to determine profits, in particular the price of the means of production advanced for production, but one needs the rate of profit (the normal uniform rate of profit) to determine long term normal (or production) prices. "In that early and rude state of society which precedes both the accumulation of stock and the appropriation of land, the proportion between the quantities of labour necessary for acquiring different objects seems to be the only circumstance which can afford any rule for exchanging them for one another." But when profit and rent make their appearance alongside the worker's income, the rule is no longer applicable. The price of a commodity is then obtained by 'adding up' its component parts, namely: wage, profit and rent. The adding up theory implied that profits and wages had an independent determination. Hence, if profits went up, and prices too, real wages might not decrease. As a result, one cannot determine profits independently of prices. Ricardo saw the limitations of the adding up theory. In his early writings he solved the problem by presuming that the economy produced corn (grain) with corn and labor, and the surplus was a physical amount of corn, so the rate of profit could be measured as ratio of corn (the surplus) to corn (the means of production advanced for production). He, then used, the labor theory of value as an approximation to the solution in his Principles, knowing that prices were not exactly proportional to the amounts of labor directly and indirectly used in production. That was, also, essentially the role of the LTV in Marx's volume I of his masterpiece Capital. That is, the LTV allows Marx to determine the rate of profit independently of prices. Note that Marx was also aware that relative prices determined by the amounts of labor directly and indirectly incorporated are incorrect once you have produced means of production. However, Marx thought that embodied labor redistributed by the process of competition meant that in the aggregate total surplus value corresponded to total profits, even if prices of production deviated from embodied labor. As a result, on the basis of the LTV it was still possible to obtain the correct rate of profit. As it turns out, there is no reason for positive and negative deviations of prices of production from the labor values to cancel out. You cannot argue with the algebra. Marx had no way of knowing this. Only with Bortkiewicz, Dimitriev and Tugan-Baranovsky's work, early in the 20th century, this was clearly understood. If in general commodities do not exchange at labor values, then there is no reason why that should be correct for two composite commodities that make the total physical surplus and the physical advanced means of production. Sraffa's solution, based on the standard commodity (to be discussed in another post), shares with Ricardo's corn model the idea that one can measure the rate of profit as a share of a particular commodity (Sraffa's being a composite commodity, that is, composed of several goods). It also shares with Ricardo the fact that only basics (commodities that enter the production of all goods including their own production), which for simplicity can be related to subsistence goods, affect the rate of profit, while non-basics, or luxury goods, are not relevant. Further, as noted by Sraffa too, his solution resembles Smith's since the standard commodity can be seen as akin to the former's idea of labor commanded, that is relative prices are proportional to the amount of labor that they can command (buy). In that sense, Sraffa's prices are firmly based on a certain notion of the labor theory of value. Mind you, in the central issues Marx's theory was correct. Once you determined exogenously the real wage, and the technical coefficients of production are given, one can determine the rate of profit, and it is inversely related, everything else constant, with the real wage. Hence, the theory of distribution based on class conflict which is the central element of the surplus approach, including Marx, is logically consistent [which is more that can be said about marginalism, as showed by the capital debates]. "The proof that labour is exploited, in particular, does not lie in the validity of a quantitative correspondence of surplus exchange value with surplus labour time; this is a misconception that derives from a mistaken acceptance of the argument that the inability to prove such a correspondence might mean that the capitalists contribute to production, that profits reflect their contribution, and that this is the reason why commodities do not exchange in proportion to labours embodied – the argument of the ‘vulgar’ economists and then of the marginalist critics of Marx" (emphasis added). "Imagine an isolated market economy where production is carried out by self-employed artisans and cooperatives, and the rate of profit is zero: prices of production are proportional to labours embodied. One day Gengis Khan’s army invades this community, but instead of killing everybody Gengis Khan announces that he will be content with collecting a yearly monetary tax at a rate r=20% on the value of the capital employed in each productive activity, a tax he will then use to buy goods on the market. The community is obliged to accept, and prices of production come to include a 20% tax on the value of capital which has the same effect on relative prices, and on real wages, as a 20% rate of profit. Relative prices are no longer proportional to labours embodied, Marx’s r=S/(C+V) does not work, but production is still performed by the same labourers, and the goods appropriated each year by Gengis Khan with the income deriving from the tax do not reflect any productive contribution of the oppressors. One would have little hesitation, it would seem, to say that Gengis Khan is exploiting this community. But if Gengis Khan had imposed the tax as a given percentage of wages, with the rate of profit remaining zero, then relative prices would have remained proportional to labours embodied, but exploitation would be still there. On the other hand, imagine that the 20% tax rate on the value of capital is imposed not by Gengis Khan but by unanimous popular vote because it is decided to use it to help for some years another community struck by an earthquake: in this case the surplus product would again be associated with an impossibility to explain prices with the labour theory of value, but few would call the surplus product the fruit of labour exploitation. All this shows that the proportionality or non-proportionality between exchange values and labours embodied reflects, not the absence or presence of other productive contributions besides that of labour, but only the specific way the mode of appropriation of the surplus product affects relative prices; the origin of the surplus remains to be ascertained" (emphasis added). * Petri provides a critique of NI and TSS solutions of the transformation problem too. A different solution, that is more Ricardian in assuming that embodied labor provides a good empirical approximation to production prices, is provided by Shaikh (1977). ** Interestingly Petri quotes several passages in which Foley tends to suggest that Marxism and marginalism are not necessarily incompatible. Foley, Duncan and Gérard Duménil (2008). "Marxian transformation problem." The New Palgrave Dictionary of Economics. Second Edition. Steven N. Durlauf and Lawrence E. Blume. (eds. ), The New Palgrave Dictionary of Economics. Palgrave Macmillan. Mongiovi, Gary (2002). "Vulgar Economy in Marxian Garb: A Critique of Temporal Single-System Marxism," Review of Radical Political Economics, 34(4), pp. 393-416. Petri, Fabio (2012). "On Recent Reformulations of the Labour Theory of Value," Quaderni del Dipartamento di Economia Politica e Statistica, Università degli Studi di Siena, No. 643. Shaikh, Anwar (1977). "Marx's Theory of Value and the Transformation Problem,"in Jesse Schwartz (ed. ), The Subtle Anatomy of Capitalism. Goodyear Publ. Co.